“Driving through Savannah with a tiny house is nerve-wracking,” Dan Louche, from Tiny Home Builders, warned us over a slice of pizza in Atlanta. And he was right. 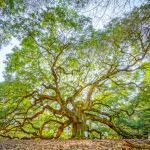 Savannah streets are known to be lined with oaks, creating a canopy of low hanging branches that dangle wispy moss on passing cars. These oaks are alluring and exquisite, but don’t let them fool you, they are tiny house assassins. My house is 13’5″ and the thought of a convertible tiny house scares me. Luckily we made it through the deadly tunnel of oaks, and parked in the driveway of Nicki Davis, a soon-to-be tiny houser. In fact, she was due to be a tiny house mommy any minute! We purposefully arrived on her delivery date, to help her welcome the tiny bundle of joy. A few hours later, her tiny home named the “Ravenlore” made its grand entrance and parked next to ours. Ravenlore is a twenty two foot victorian style tiny home. It’s purple and pink and full of pizazz! Tiny Green Cabins built Nicki’s tiny home over the wheels, which maximizes the amount of interior space. This also makes her home heavier than most, which is why Ravenlore’s trailer has four axles. Details in the tour below! We had an open house with Ravenlore, which was a lot of fun and gave Nicki a chance to hold a garage sale at the same time. Downsize, downsize, downsize! One thing I have to mention is that Nicki is a firefighter – which already makes her a badass, but not only that, she runs 5Ks in full gear! A tiny house fire-fighting chick?? Bottom line, she is my hero. Guillaume and I spent a week parked in Nicki’s driveway, and it rained every single day. As a result, most of our time in Savannah was spent eating and relaxing, but we did venture out a few times. Once to River Street, ducking in and out of shops between storms. Our favorite shop was the Savannah Bee Company, not only because they allowed our dog inside, but they also had a delicious assortment of honey available for tasting! Have you ever been to a honey tasting? Well, if you haven’t, you’re missing out. One evening we endured the drizzle for dinner, drinks and a movie at The Florence. They were screening “The Life Aquatic,” another favorite film of mine, and another Guillaume had never seen. We ordered a flight of beers and a few tasty small plates. There’s nothing like a movie on a rainy evening! 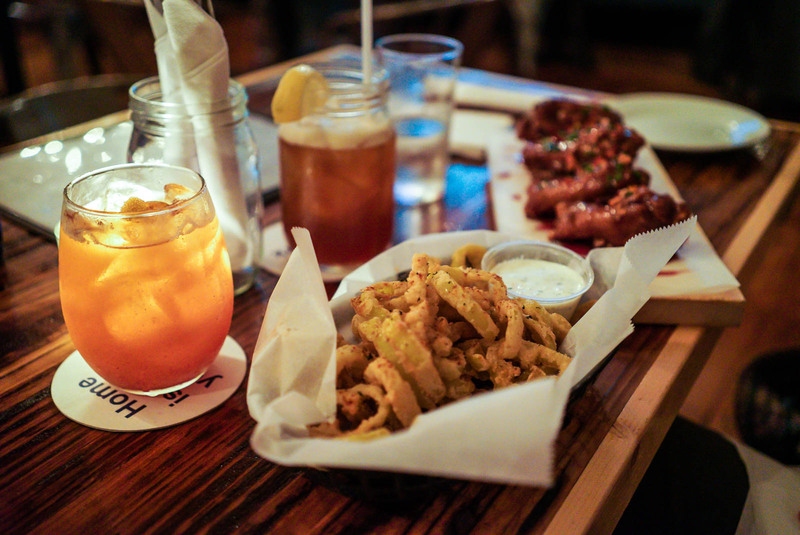 On another evening, when we were feeling a twinge of cabin-fever, Guillaume and I treated ourselves to dinner at Treylor Park, a relatively new restaurant in Savannah that seemed appropriate to our current lifestyle (their motto: “Live Sensibly”). 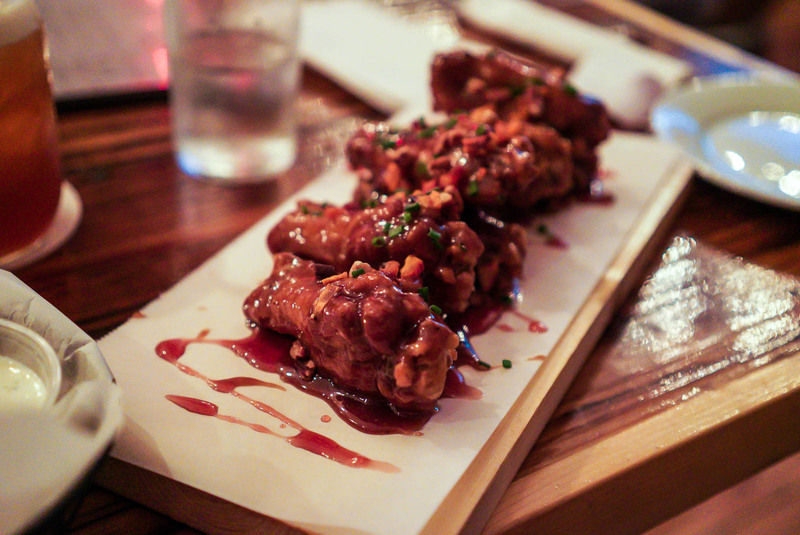 We ordered the fried banana peppers and pb&j hot wings, which were both mouthwatering and messy! The rain stopped for a few hours one morning, and we managed to tour Fort Pulaski with the help of our new friend Laurie. The fort itself is an amazing piece of architecture. We marched around the top level, where Confederate soldiers fired canons against the Union army to protect Savannah. After its surrender, Fort Pulaski was manned by freed African American soldiers, which I found to be interesting. 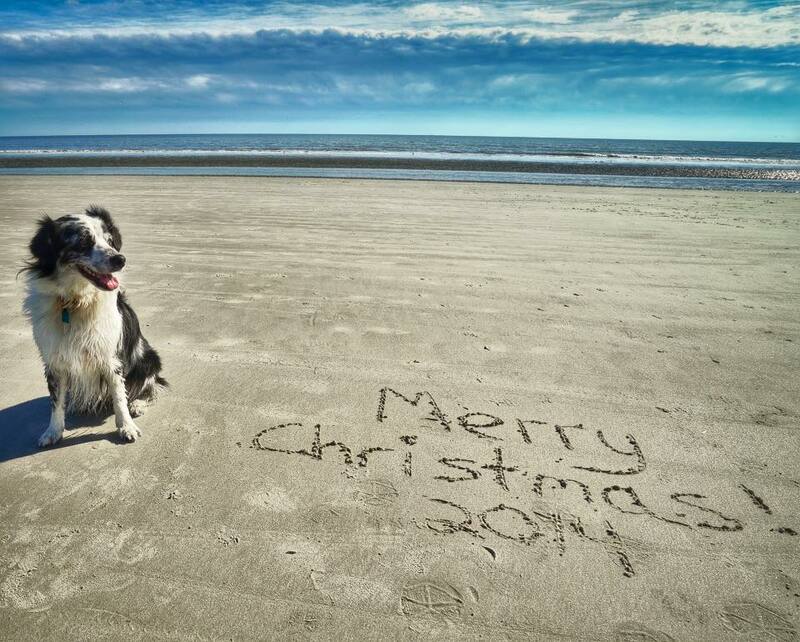 On Christmas day, Guillaume and I decided to head out to Hilton Head Island. This was Laurie’s suggestion, and it turned out to be an excellent one. The weather was absolutely perfect on the island, which confirmed my suspicions that Savannah was the victim of some plague. Guillaume and I casually shuffled down the beach, snickering.. It’s Christmas… and we’re at the beach! That evening, we hustled back to town and went to dinner at The Ole Pink House. It was the quintessential Savannah experience. The Ole’ Pink House was built in 1789 and it features two levels of fine dining and a basement tavern. For Christmas they were offering a three-course meal. Everything was fantastic, but my scored flounder main course was by far the winner of the evening. It was exquisite and original. We did not take home any leftovers. The next day we left Savannah, and the sun came out to celebrate our departure. I’m not going to hold it against you, Savannah, but it appeared as if you were happy to see us go. Perhaps we were plaguing you… I hope that’s not the case, because we might be back someday. 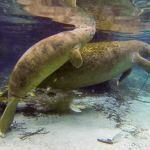 Next up: We take a swim with an endangered animal. Can you guess where? 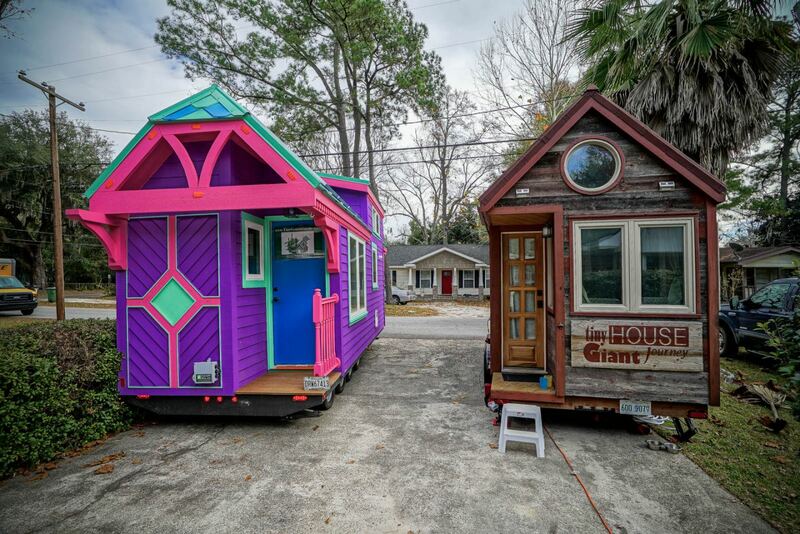 Please tell me when the story of Tiny house… will be televised. My daughter unexpectedly viewed it recently and saw that I was in it. I would love to see it. Thank you. Christinetwitte@gmail.com I have enjoyed reading about your journey. Hi Christine, I’m not exactly sure what you’re talking about. Are you sure it was our episode? That has to be my favorite so far. Awesome job getting all the areas!